Although arteriovenous fistulas are considered superior to grafts, it is unknown whether that is true in the subset of patients with a previous failed fistula. For investigation of this question, a prospective vascular access database was queried retrospectively to compare the outcomes of 59 fistulas and 51 grafts that were placed in the upper arm after primary failure of an initial forearm fistula. Primary access failure was higher for subsequent fistulas than for subsequent grafts (44 versus 20%; P = 0.006). Fistulas required more interventions than grafts before their successful use (0.42 versus 0.16 per patient; P = 0.04). The time to catheter-free dialysis was longer for fistulas than for grafts (131 versus 34 d; P < 0.0001) and was associated with more episodes of bacteremia before permanent access use (1.3 versus 0.4 per patient; P = 0.003). Cumulative survival (from placement to permanent failure) was higher for fistulas than for grafts when primary failures were excluded (hazard ratio 0.51; 95% confidence interval 0.27 to 0.94; P = 0.03), but similar when primary failures were included (hazard ratio 0.99; 95% confidence interval 0.61 to 1.62; P = 0.97). Fistulas required fewer interventions to maintain long-term patency for dialysis after maturation (0.73 versus 2.38 per year; P < 0.001). In conclusion, as compared with grafts, subsequent upper arm fistulas are associated with a higher primary failure rate, more interventions to achieve maturation, longer catheter dependence, and more frequent catheter-related bacteremia. However, once the access is usable for dialysis, fistulas have superior cumulative patency than do grafts and require fewer interventions to maintain patency. The National Kidney Foundation Kidney Disease Outcomes Quality Initiative (KDOQI) guidelines for Vascular Access recommend increasing the proportion of arteriovenous fistulas among hemodialysis patients (1). Adherence to these recommendations has increased the prevalence of fistulas in US hemodialysis patients from 26 to 35% (2). A major hurdle to increasing further the proportion of fistula use is the high rate of primary fistula failures (fistulas never usable for dialysis) because of early thrombosis or failure to mature (3). Given the high rate of primary fistula failure, a subsequent access will often need to be created in the upper arm. The subset of patients who have a second fistula placed after failure of an initial primary forearm fistula may differ from other patients in that they may be at higher risk of failure of their second fistula. In addition, they are more likely to already be receiving dialysis, such that they are dependent on catheters, with all of their attendant complications. Therefore, it is not clear whether fistula outcomes are superior to those of grafts in this high-risk patient subset. The goal of this study was to compare the outcomes of upper arm fistulas and upper arm grafts that were placed in patients whose initial forearm fistula had a primary failure. In addition, this study evaluated the clinical consequences of placing the two types of subsequent access, including the duration of catheter dependence and frequency of catheter-related complications. The University of Alabama at Birmingham oversees the medical care of 450 patients who receive in-center hemodialysis at five units in metropolitan Birmingham. Ten full-time clinical nephrologists, all faculty members in the Division of Nephrology, provide medical care to these patients. Four experienced transplant surgeons perform all vascular access procedures, and the Department of Radiology performs diagnostic studies and interventions for dialysis access. Two full-time access coordinators in the Division of Nephrology scheduled all vascular access procedures and maintained a prospective, computerized access database of the procedures and their outcomes (4). Preoperative mapping was performed routinely to assist the surgeons in the optimal planning of access surgery (3,5,6). The preoperative diameter criteria used for placement of an upper arm access included a minimum artery diameter of 2 mm and a minimum vein diameter of 2.5 mm for fistulas and 4.0 mm for grafts. In addition, all draining veins were assessed for stenosis or thrombosis throughout their course. In selected patients, additional imaging was performed to exclude central vein stenosis. Although our institutional consensus was to favor fistulas over grafts, the final decision about the type of access to be placed in a given patient was at the discretion of the surgeon. Fistulas were allowed to mature for 8 to 12 wk and grafts for 2 to 3 wk before initial cannulation. Postoperative ultrasonography was performed to assess fistula maturation whenever there was clinical uncertainty (7). Fistulas that were deemed immature by postoperative ultrasound were referred to Radiology or Transplant Surgery for salvage procedures (8). When a patient’s initial fistula failed to mature, the surgeon typically placed a subsequent access in the upper arm. The decision on whether to place an upper arm fistula or graft was determined on the basis of preoperative vascular mapping and clinical judgment. Patients who were already on dialysis used tunneled catheters until their permanent access had matured. All elective access procedures (creation of fistula or graft, angioplasty, thrombectomy, surgical revision, and placement or exchange of tunneled catheters) were performed in the outpatient setting. Access-related hospitalizations were required only in the subset of patients who had catheter-related bacteremia and were severely symptomatic. Approval was obtained from the University of Alabama at Birmingham Institutional Review Board to review patients’ medical records for research purposes. We retrospectively queried our prospective vascular access database to identify all 769 new fistulas that were placed during a 5-yr period (January 1, 2000, to December 31, 2004). A fistula was deemed to have had a primary failure when it never matured adequately to be used successfully for dialysis. During the study period, 268 patients had an initial forearm fistula, 155 of whom had a primary fistula failure. Of these 155 patients, three received a subsequent contralateral forearm fistula, 13 received a forearm graft, six were switched to peritoneal dialysis, and 23 had no subsequent access placed (i.e., remained catheter dependent). A subsequent upper arm access (fistula or graft) was placed in the remaining 110 patients, and this last group constituted the study population. Patient records were reviewed to determine demographic and clinical information, including age, gender, race, diabetes, and peripheral vascular disease. We prospectively followed these patients from the time of access placement until cumulative access failure to determine (1) primary access failure, (2) primary (unassisted) access survival, (3) cumulative (assisted) access survival, (4) duration of catheter dependence from access placement to its use for dialysis, and (5) number of episodes of catheter-related bacteremia during access maturation. The clinical outcome of each upper arm access (fistula or graft) was determined from the computerized access database. Primary access failure was declared when the access was never usable for dialysis. Primary (unassisted) access survival was calculated from the time of access placement until the first access intervention (thrombectomy, angioplasty, or surgical revision) to maintain its patency for dialysis. For the purpose of this analysis, a fistulogram that was performed without a concurrent angioplasty was also considered to be an access intervention. Cumulative (secondary) access survival was calculated from access creation to permanent failure, regardless of the number of interventions required to maintain long-term patency for dialysis. The number of access interventions that were required before the access could be used for dialysis was calculated for each patient. The duration of catheter dependence was calculated for each patient as the time from upper arm access placement to the time of removal of the tunneled catheter after successful cannulation of the access for dialysis. Patients whose access was placed before initiation of dialysis were excluded from this particular calculation. Catheter-related bacteremia was diagnosed in catheter-dependent patients with fever or chills and positive blood cultures, in the absence of an alternative source of infection (9). 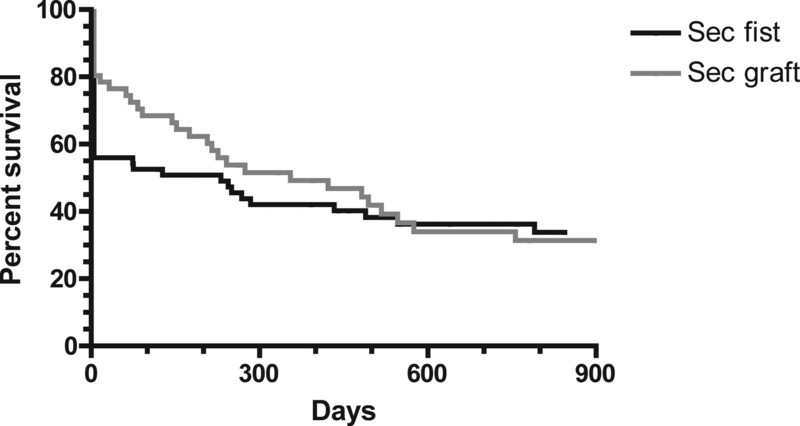 Primary (unassisted) and cumulative (assisted) access survival was plotted using Kaplan-Meier survival techniques, with patient follow-up censored for death (n = 9), kidney transplant (n = 1), transfer to a nonparticipating dialysis unit (n = 5), or end of the study follow-up (December 31, 2005). Fistulas and grafts with primary failures were considered to have a survival of 0 d because they were never usable for dialysis. Access survival was compared between the subsequent upper arm fistulas and grafts by the log rank test. Univariate Cox proportional hazard models were fit. Hazard ratios (HR) and their associated 95% confidence intervals (CI) were computed. Finally, multiple variable survival analysis was used to model the association between the clinical variables and secondary access survival. To evaluate whether there was an interaction between time and access survival, we defined a time-by-group interaction variable. We re-estimated our Cox model after adding this covariate to the model. Other access outcomes were compared between groups using unpaired t test or χ2 test. P < 0.05 was considered statistically significant. Table 1 summarizes the demographic and clinical characteristics of patients who received an upper arm access after the primary failure of their initial forearm fistula. Patients who received an upper arm fistula were more likely to be male than those who received an upper arm graft (P = 0.04). However, the two groups were similar in terms of age, race, and frequency of diabetes and peripheral vascular disease. The majority of patients in both groups were black, reflecting the demographics of our hemodialysis population. Obesity (body mass index ≥30 kg/m2) was present in 38% of the study population but did not differ significantly between the groups. The majority (80%) of patients who received an upper arm access (fistula or graft) had already started dialysis. The preoperative vascular mapping that was obtained before access creation showed vasculature suitable for either an upper arm fistula or an upper arm graft in the study population, using our objective sonographic criteria. The mean preoperative diameter of the artery was slightly but significantly higher in the patients who received an upper arm fistula than in those who received a graft (P = 0.04; Table 1). However, the arterial diameters in both groups were well above the minimum 2.0-mm diameter required. The preoperative vein diameters were similar in both groups (P = 0.63). Among the upper arm fistulas placed, 51 were brachiocephalic fistulas and eight were transposed brachiobasilic fistulas. Primary access failure was twice as common in patients who received a subsequent upper arm fistula, as compared with those who received an upper arm graft (Table 2). Patients with upper arm fistulas required significantly more access interventions before successful cannulation for dialysis, as compared with those with upper arm grafts (0.42 versus 0.16 interventions per patient; P = 0.04). The duration of catheter dependence was evaluated for the subset of patients who were already on maintenance dialysis when they received their upper arm access (43 fistulas and 45 grafts). The median duration of catheter dependence until successful cannulation of the upper arm access was significantly longer for fistulas than for grafts (131 versus 34 d; P < 0.0001). During the catheter-dependent period (while awaiting access maturation), the patients with upper arm fistulas averaged 1.3 episodes of catheter-related bacteremia, compared with 0.4 episodes in the patients with upper arm grafts (P = 0.003). 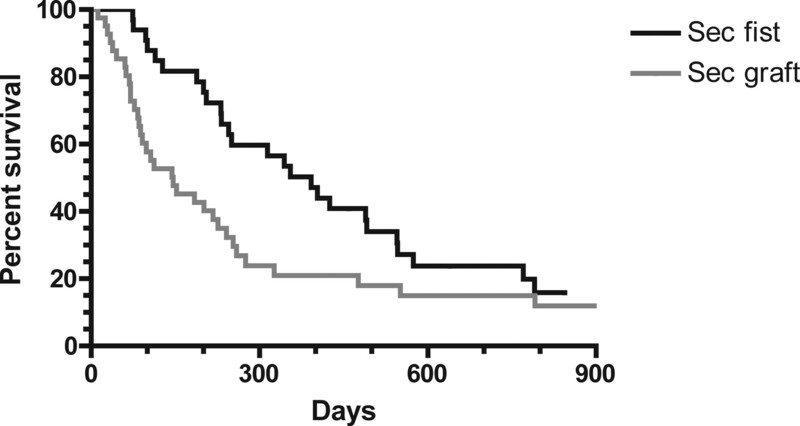 The rate of catheter-related bacteremia normalized to 1000 catheter-days was similar in both groups (Table 2). There were seven hospitalizations for catheter-related bacteremia in the fistula group and three in the graft group. There were no deaths related to access-related infections in the study population. There was one graft infection. The mean duration of patient follow-up was 9.7 mo in the fistula group and 13.4 mo in the graft group. When primary access failures were included in the analysis, the cumulative access survival did not differ significantly between the two groups (median survival 231 versus 355 d; HR 0.99, 95% CI 0.61 to 1.62; P = 0.97; Figure 1). However, when patients with a primary access failure were excluded, the cumulative access survival was significantly longer for upper arm fistulas, as compared with grafts (median survival 1524 versus 517 d; HR 0.51, 95% CI 0.27 to 0.94; P = 0.03; Figure 2). Cumulative access survival (time from access creation to access failure), including primary access failures (P = 0.97). Sec fist, secondary upper arm fistula after primary failure of forearm fistula; Sec graft, secondary upper arm graft after primary failure of forearm fistula. Cumulative access survival (time from access creation to access failure), excluding primary access failures (P = 0.03). Similarly, when primary access failures were included in the analysis, the unassisted survival did not differ between upper arm fistulas and grafts (median survival 100 versus 91 d; HR 0.88, 95% CI 0.56 to 1.32; P = 0.50; Figure 3). However, when primary access failures were excluded, the primary (unassisted) survival of upper arm fistulas was superior to that of upper arm grafts (median survival 392 versus 146 d; HR 0.54, 95% CI 0.32 to 0.87; P = 0.01; Figure 4). After access maturation, patients with fistulas required significantly fewer interventions (fistulogram, angioplasty, thrombectomy, or surgical revisions) than did those with grafts to maintain long-term access patency for dialysis (0.73 versus 2.38 per year; P < 0.001). The total rate of interventions for the life of the access (from its creation to permanent failure) was also significantly lower for fistulas than for grafts (1.28 versus 2.66 per year; P = 0.005). Primary access survival (time from access creation to first access intervention), including primary access failures (P = 0.50). Primary access survival (time from access creation to first access intervention), excluding primary access failures (P = 0.01). On multiple variable survival analysis with access type, age, gender, diabetes, peripheral vascular disease, obesity, and preoperative artery and vein diameters in the model, access type was the only significant factor associated with cumulative access survival excluding primary failures (HR for graft versus fistula failure 2.01; 95% CI 1.05 to 3.82; P = 0.03). None of the factors was significant in the multiple variable survival analysis of cumulative access including primary failure, primary access survival excluding primary failure, or primary access survival including primary failures. There was a significant interaction between time and access survival (P = 0.01) for unassisted survival excluding primary failure, indicating that unassisted survival was better for fistulas in the early period but better for grafts in the late period. There was no significant interaction between time and access survival for the other three models (cumulative survival including primary failures, cumulative survival excluding primary failures, and unassisted survival including primary failures). The KDOQI recommendations to place a fistula in preference to a graft are predicated on the evidence that fistulas have superior cumulative survival than do grafts and require fewer interventions to maintain their long-term patency for dialysis (5,10–16). In patients with a primary failure of their initial forearm fistula, the current recommendations are to place a new fistula in the upper arm. The decision in this case differs from that regarding the initial access placement in two important respects. First, patients whose initial forearm fistula failed may be at increased risk for failure of their subsequent fistula, as compared with those who receive their initial fistula. Second, patients are much more likely to have already initiated hemodialysis by the time their second access is placed. This means that they are catheter dependent until the access is ready to cannulate. This study documents in quantitative terms the trade-offs that are involved in placing an upper arm fistula after a primary failure of the initial forearm fistula. As compared with a subsequent upper arm graft, fistulas had a two-fold higher risk for primary failure and required substantially more interventions to promote fistula maturation. Moreover, patients who received an upper arm fistula were catheter dependent for 3 mo longer than those who received a graft. This longer period of catheter dependence translated into a more than three-fold higher frequency of catheter-related bacteremia until the permanent access could be used. Although not documented in this study, we previously observed that catheter-dependent patients are three times as likely to receive an inadequate dosage of dialysis, as compared with patients who undergo dialysis with a fistula or a graft (17). However, both primary and cumulative access survival were significantly longer for fistulas than for grafts, when one excludes patients with primary failure of their access. In addition, maintenance of the long-term patency of the access for dialysis entailed a three-fold lower frequency of intervention (fistulogram, angioplasty, thrombectomy, or surgical revision) for upper arm fistulas as compared with grafts. However, when primary access failures were included in the survival analysis, the superior survival of fistulas over grafts was no longer evident. Two previous studies compared the outcomes of upper arm fistulas and grafts (10,14). Both documented a higher primary failure rate of fistulas over grafts. In addition, Oliver et al. (14) documented longer catheter dependence after placement of a fistula, as compared with a graft. Both observed a lower frequency of interventions in fistulas than in grafts to maintain their long-term patency for dialysis. In agreement with this study, Oliver et al. (14) demonstrated a superior primary and cumulative survival of fistulas over grafts when primary failures were excluded but a comparable survival when primary failures were included. There was also a trend of higher rates of catheter-related bacteremia in patients who received a fistula, as compared with those who received a graft. Our study was restricted to patients who received a subsequent upper arm access after primary failure of their initial forearm fistula, whereas the study by Oliver et al. (14) included many patients in whom the upper arm access was their first vascular access. Notwithstanding some differences in the dialysis populations enrolled in these three studies, they all illustrate similar trade-offs between upper arm fistulas and grafts. Published data demonstrate that US nephrologists have been heeding the Fistula First recommendations. The proportion of US hemodialysis patients who undergo dialysis with fistulas increased from 26 to 35% in the 5-yr period between 1998 and 2003 (2). During the same time period, catheter use increased from 19 to 27%. Therefore, it seems that each 1% increase in fistula prevalence is associated with a corresponding 1% increase in catheter prevalence. This is most likely due to increased numbers of primary fistula failures. If this trend continues, then achieving fistula use in 50% of US hemodialysis patients may entail accepting catheter use in 40%, a scenario that closely mirrors the Canadian numbers (18). This creates a dilemma, in that adhering to one desirable guideline (increasing fistulas) has the unintended consequence of worsening adherence with another desirable guideline (reducing catheters). Achieving the optimal balance between these two competing goals requires an individualized approach. In a subset of patients who are at high risk for failure of maturation of fistulas, it may be preferable to place a graft instead, so as to minimize the duration of catheter dependence. The trade-offs are particularly pronounced in patients who are already on dialysis when they receive their upper arm access. In this patient subset, delays in achieving a working vascular access directly translate into prolonged catheter dependence and more episodes of catheter-related bacteremia. Certainly, concerted efforts to optimize fistula outcomes are indicated, including early referral to surgeons for fistula creation, preoperative vascular mapping, improvements of surgical technique, aggressive attempts to salvage immature fistulas, and education of staff in cannulation techniques. At the same time, there is a growing body of evidence showing that some dialysis patients are at high risk for primary fistula failure despite optimal vascular access management. 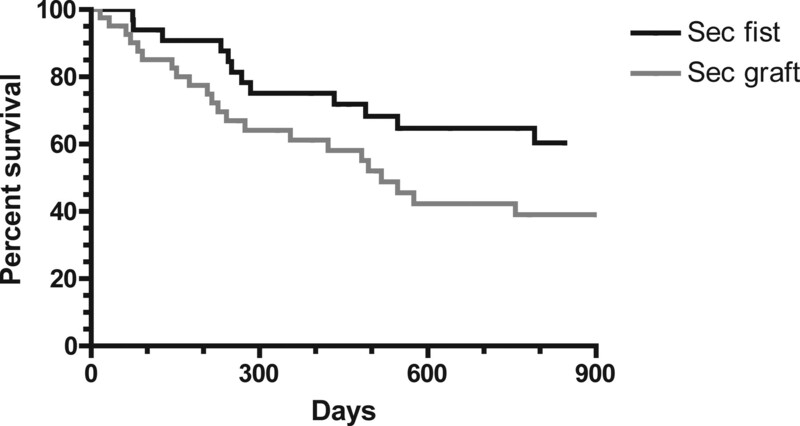 This subset of patients may be better served by having a graft placed, rather than by subjecting them to prolonged catheter dependence with its risks of recurrent bacteremia and suboptimal dialysis. This study has some limitations. First, it was a single-center study and the results may not generalize to all hemodialysis units in the United States. In our study population, it seems that patients who had a primary failure of their initial forearm fistula and whose expected survival was <2 yr may have been better off receiving a graft rather than a fistula. However, the trade-offs between placement of subsequent fistulas and grafts that were observed in our investigation may be more clearly in favor of fistulas in dialysis centers with a lower rate of primary fistula failure, shorter time to fistula maturation, or lower rate of catheter-related bacteremia. Second, this study was retrospective. However, the vast majority of access procedures were performed at a single hospital by one group of surgeons and one group of radiologists, and all access procedures were maintained in a prospective, computerized database. Therefore, we are confident that the study included a comprehensive list of patients who fulfilled the study criteria and an accurate account of the outcome of each vascular access. Finally, in common with previous publications (10,14), this was not a randomized clinical trial, and there may have been undocumented differences between patients who received upper arm fistulas and those who received grafts. Given the strong “fistula first” recommendations in the KDOQI guidelines, it may seem heretical to recommend placing a graft, rather than a fistula, in some dialysis patients. However, early fistula failure is more common in certain patient subsets, including women, nonwhite individuals, older patients, and obese individuals (8,19,20). Used in combination, such clinical factors may be useful in stratifying the risk for primary fistula failure (20). Moreover, accelerated neointimal hyperplasia that leads to primary fistula failure has been associated with pathophysiologic conditions that favor hemodynamic stress, vasoconstriction, platelet aggregation, and endothelial dysfunction (21,22). It is likely that the variability in vascular access outcomes is affected by individual variations in the expression of vasoactive substances that modulate neointimal hyperplasia. In this regard, recent retrospective studies have implicated genetic polymorphisms in differences in fistula failure rates (23–25). Using clinical and genetic prognostic factors gleaned from such observations, it should be possible to identify a subset of hemodialysis patients who are at high risk for early fistula failure. A randomized, multicenter clinical trial that allocates high-risk patients to placement of a fistula or a graft should be performed. Such a study would help to quantify the trade-offs between fistulas and grafts and to identify which patients are best suited for each type of vascular access. It would also provide meaningful economic comparisons of all access-related procedures and hospitalizations in patients who are randomly assigned to each access type, akin to a recent economic analysis performed on a nonrandomized cohort (26). Our findings have important clinical implications for the unbiased presentation of vascular access options to dialysis patients. If patients are simply informed that fistulas have better long-term survival than grafts, then they are likely to prefer a fistula. However, if they are also informed that they also have a high risk for primary fistula failure and prolonged catheter dependence with its associated risks, then they may prefer a graft. This may be particularly true for patients who return to the surgeon after a primary failure of their initial fistula or patients with a relatively short life expectancy. Clinical trade-offs are involved in the decision about placing an upper arm access in patients whose initial forearm fistula has failed. As compared with a graft, placement of a fistula increases the risk for primary failure and requires more interventions to achieve maturation. If the patient is already on dialysis, then fistula placement also entails longer catheter dependence and a higher risk for catheter-related bacteremia. However, for the subset of accesses that are usable for dialysis, fistulas have longer cumulative patency and require fewer interventions. This research was supported in part by grant 1 K24 DK59818-01 from the National Institute of Diabetes and Digestive and Kidney Diseases to M.A. and the National Kidney Foundation Research Fellowship and the University of Alabama at Birmingham Clinical Investigator Research Fellowship to T.L. Portions of this manuscript were presented in abstract form at the annual meeting of the American Society of Nephrology; November 14 through 19, 2006; San Diego, CA. Interventional Nephrology: When Should You Consider a Graft?